Bristol owner Steve Lansdown says the Rugby Football Union have been "totally unprofessional" in their attempt to try and recruit coach Steve Borthwick. However, he confirmed the club are now negotiating a compensation deal with the RFU to allow Borthwick to join Eddie Jones' England backroom team. "They think they can ride roughshod over everybody, but they are finding out they can't," said Lansdown. "I can't believe that the the governing body has acted in such a way." Borthwick agreed a long-term contract with Bristol following the World Cup and despite handing in his resignation and the RFU releasing a statement saying the former England captain would work for new national team boss Jones as forwards coach, Championship leaders Bristol have yet to release him. Likewise, Premiership side Northampton have taken issue over the RFU's approach for backs coach Alex King, with Saints boss Jim Mallinder saying the club have been "kept in the dark". "It is totally unprofessional," Lansdown he told BBC Radio Bristol. "I don't think the RFU have covered themselves in any form of glory whatsoever." 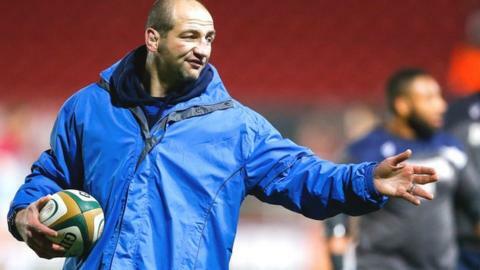 He said the club did not wish to stop 36-year-old Borthwick from taking the England job, negotiations with the RFU were "not always pleasant". Lansdown continued: "Our stance, from Steve Borthwick's point of view is that it is big career move and we don't want to stand in his way. But we want adequate compensation to allow him to go. "We put in a lot of time and effort in recruiting Steve. He has been in a short period of time and made a big difference to us already and we have an eye on winning the play-offs. We wanted him for that, we have aims and ambitions."